Camberley Heath Golf Club welcomes prestigious guests, members and visitors to enjoy their facilities in Camberley, Surrey on a daily basis, whilst also hosting various special events throughout the year. With a large kitchen facility the golf club offers a variety of food throughout the day, into the late evening along with catering for larger events and private dining. However, as the kitchen was powered soley by gas fired equipment, this meant each year it would run up huge utility bills due to the in-efficiency of this equipment. Looking for advice, Head Chef, David Heath contacted Target to discuss possible solutions in becoming a more efficient and sustainable commercial kitchen. The existing cookline contained three six burner gas ranges, a gas solid top range, a gas salamander grill and two Rational combination ovens. The main concern was the excessive wasted energy generated by the gas ranges and the gas salamander grill. 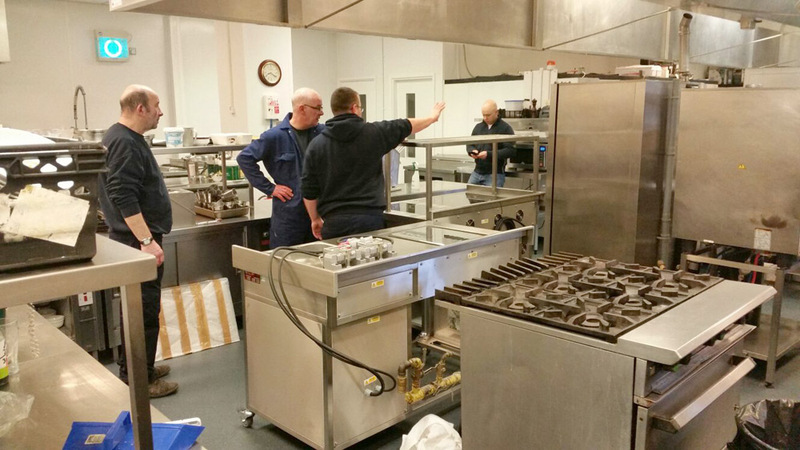 This resulted in the replacement of the existing gas equipment with two bespoke induction suites which incorporated a French plancha and FriFri filtration fryer alongside heavy duty induction cooktops. Accompanied by a fast action rise and fall salamader grill and Blue Seal Turbofan® convection ovens. With it's limited ventilation system requirements, the commercial kitchen induction stove setup was ideal for producing the la carte menu and offering an early morning back bar cooking facility whilst complimenting the cooking capacity of combination ovens for events and wedding catering. With the kitchen was being used on a daily basis, it was imperitive that there would be minimal downtime and disruption during installation. 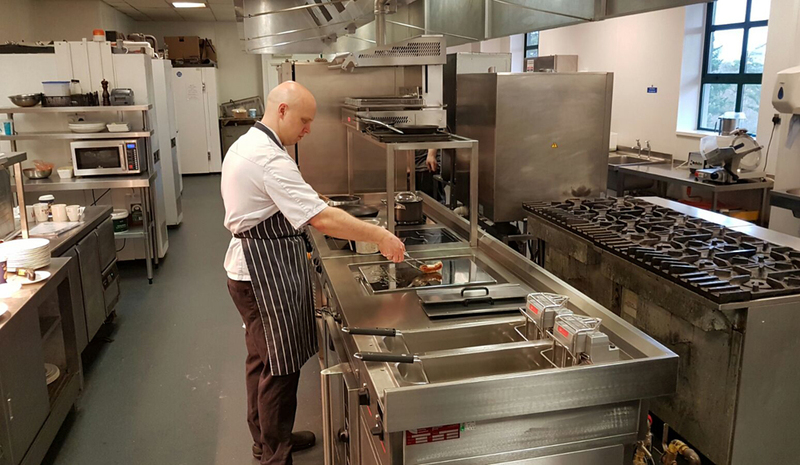 With this in mind the Target bespoke induction ranges were the perfect choice for Chef David as they are manufactured completely off-site for quick and easy installation to pre-installed services. The access to the kitchen was up 3 flights of stairs. The units were therefore specially designed as two modular sections rather than a large single unit to enable them to be lifted easily and safely into position. The Target installation team arrived on site for an early start. The golf club's local gas engineers were on-site to remove the exisitng gas equipment with the Target team following swiftly behind installing the new induction suite, having it all up and running ready for the 9am start for breakfast. The kitchen now operates efficiently with their new Target bespoke commercial induction range in place, and with happy chefs working in a more comfortable working environment. For more information on Target bespoke commercial induction ranges CLICK HERE.